I came across this recipe from Whole Foods. Not only are they one of my favorite places to shop for interesting and special ingredients, they happen to have a nice selection of recipes on their website. To make these skewers, it's pretty easy. 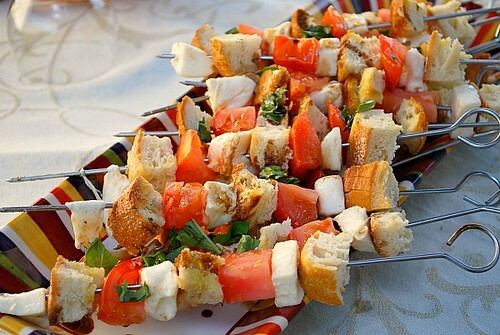 Bread cubes, tomatoes (chopped, cherry or grape tomatoes work well) and cubes o f fresh mozzarella cheese are skewered and brushed with olive oil. After a few minutes on the grill to just lightly toast the bread and slightly warm the cheese, they're plated and drizzled with balsamic vinegar and sprinkled with fresh chopped basil. So easy and perfect for an outdoor party! Grease grates with oil then preheat grill to medium heat. Meanwhile, alternating ingredients, thread tomatoes, mozzarella and bread onto skewers, brush all over with oil and season with salt and pepper. Grill skewers, turning once, until cheese is just melted and bread is toasted, 2 to 3 minutes total. Transfer to a platter, drizzle with vinegar , garnish with basil and serve. Those sound amazing!! 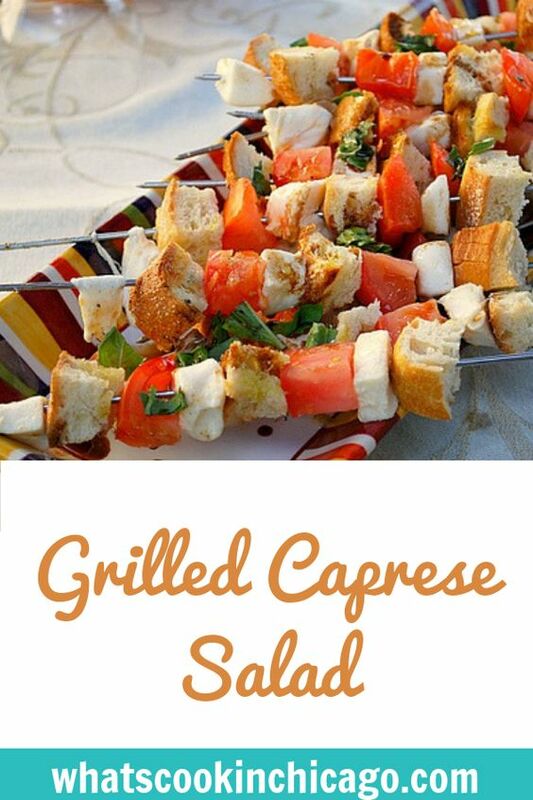 I would never think that you could grill mozzarella! These sound and look fabulous! I have a cookout planned for the 4th and am definitely adding these to it! These look so delicious! I would have never thought to put all those ingredients on a skewer...thanks for sharing! What an amazing idea! These looks so terrific! This sounds perfect for a little thing I have my planned with my best friend as a wrap up for her wedding! Thanks so much for posting this, she's gonna love it!